Rice balls called ‘onigiri‘ are one of Japan’s favourite comfort snacks. White rice shaped into balls or triangles, usually stuffed with fish or vegetable fillings and wrapped in nori seaweed. Portable and easy to eat, much like sandwich in the West. This is a fusion type of onigiri, and I love them. Cut the cheddar cheese into very small pieces. 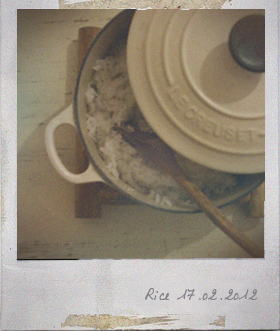 Mix the cooked rice, roasted sesame seeds and cheddar cheese. Once the rice mixture has cooled just enough, form it into 12 log-shaped rice balls. 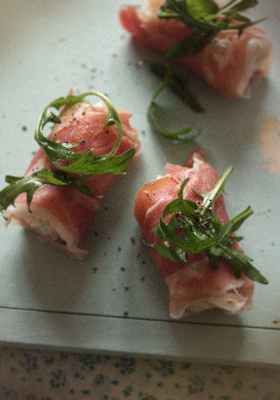 Wrap each rice ball in a strip of prosciutto. In a bowl, mix together the olive oil and balsamic vinegar and toss the wild rocket leaves. Arrange the rocket leaves on top of the wrapped rice balls and sprinkle with black pepper. You are currently reading Prosciutto Wrapped Cheese Rice Balls at Fish Trip Cafe.